The investigated cantilever beam is characterized by a constant rectangular cross-section and is subjected to a concentrated constant vertical load, to a concentrated constant horizontal load and to a concentrated constant bending torque at the free end. The same beam is made by an elastic non-linear asymmetric Ludwick type material with different behavior in tension and compression. Namely the constitutive law of the proposed material is characterized by two different elastic moduli and two different strain exponential coefficients. The aim of this study is to describe the deformation of the beam neutral surface and particularly the horizontal and vertical displacements of the free end cross-section. The analysis of large deflection is based on the Euler-Bernoulli bending beam theory, for which cross-sections, after the deformation, remain plain and perpendicular to the neutral surface; furthermore their shape and area do not change. On the stress viewpoint, the shear stress effect and the axial force effect are considered negligible in comparison with the bending effect. The mechanical model deduced from the identified hypotheses includes two kind of non-linearity: the first due to the material and the latter due to large deformations. The mathematical problem associated with the mechanical model, i.e. to compute the bending deformations, consists in solving a non-linear algebraic system and a non-liner second order ordinary differential equation. Thus a numerical algorithm is developed and some examples of specific results are shown in this paper. 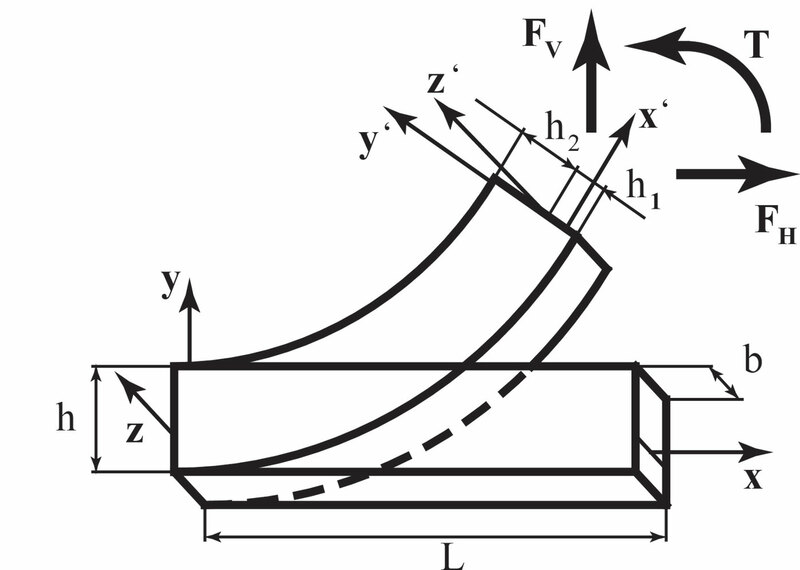 A. Borboni and D. De Santis, “Large deflection of a non-linear, elastic, asymmetric Ludwick cantilever beam subjected to horizontal force, vertical force and bending torque at the free end,” Meccanica, vol. 49, pp. 1327-1336, 2014.